The Capitals face the Vegas Golden Knights at T-Mobile Arena tonight in Game 1 of the 2018 Stanley Cup Final. Capitals captain Alex Ovechkin is making his first appearance at the Stanley Cup Final. Ovechkin has scored 12 goals this postseason and is now two goals shy of the franchise record for most goals in the postseason set by John Druce, when he scored 14 goals in 15 games in 1990. In addition, Ovechkkin has registered 22 points (12g, 10a) in 19 games and is two points shy of Evgeny Kuznetsov's current mark this postseason (Kuznetsov: 11g, 13a), which is the all-time franchise mark for points in a postseason. Ovechkin, who is fourth among active players with 58 career playoff goals, is tied with Bernie Geoffrion, Luc Robitaille, Mike Modano and Guy Lafleur for 36th in NHL history. Additionally, Ovechkin is tied for third among active NHL players (min. 20 games played) in career playoff goals per game (0.50) and tied for sixth in playoff points per game (0.97). Among the top 10 active career playoff goal scorers, Ovechkin ranks fourth, and his 0.50 goals per game ranks first among player on that list. In 116 career playoff games, Ovechkin has 112 points (58g, 54a), and ranks first in franchise history in playoff games played, goals, points, power play goals (19), power play points (48), game-winning goals (8), shots (527) and second in assists. Ovechkin aims to become the third player in NHL history to score 600 career regular-season goals before winning his first Stanley Cup (Luc Robitaille: 620 goals before 2002 Cup; Dave Andreychuk 634 goals before 2004 Cup). Additionally, Ovechkin can become the 16th player in NHL history to play at least 1,000 career regular-season games before winning his first Cup and the second to do so with the team for which he has played at least 1,000 games (Steve Yzerman with Detroit). He also seeks to become the ninth player to have 1,000 career points before capturing his first Cup. If the Capitals win the series and capture the Stanley Cup, Ovechkin (Moscow, Russia) would become the first Russian player to captain a Stanley Cup champion. Holtbeast – After recording consecutive shutouts in Games 6 and 7 in the Eastern Conference Final against the Tampa Bay Lightning, Braden Holtby became the second goaltender in franchise history to record consecutive shutouts in the Stanley Cup Playoffs, joining Olie Kolzig, who did so in Games 4 and 5 of the 1998 Conference Semifinals against the Senators. Holtby’s shutout marked his sixth playoff shutout of his career, tied with Kolzig for the most in franchise history. In addition, Holtby became the 27th goaltender in NHL history to record a shutout in a Game 7 and just the fifth to do so to clinch a berth in the Stanley Cup Final. Of those five goaltenders, Harry Lumley and Dominik Hasek also recorded shutouts in Game 6 of their respective series. Holtby is the 13th goaltender in NHL history to post two consecutive shutouts in elimination games. Holtby improved to 3-4 in seven career Game 7 appearances with a 1.81 goals against average, a .934 save percentage and a shutout. New York Rangers goaltender Henrik Lundqvist (6-2) is the only active NHL goaltender with more career Game 7 appearances. Holtby also improved his record to 8-5 in elimination games with a 1.73 goals against average, a .937 save percentage and two shutouts. In the playoffs this postseason, Holtby is 12-6 with a 2.04 goals against average and a .924 save percentage with two shutouts. Holtby ranks first among all NHL goaltenders since the 1956 season (min. 60 games played) in career save percentage and first in career goals-against average. Holtby has allowed two goals or fewer in 49 of his 77 career playoff games and Washington has posted a 35-14 record in those games. Kuz Control - Evgeny Kuznetsov recorded an assist in Game 7 of the Eastern Conference Final to extend his point streak to 10 games (6g, 9a), establishing a new franchise record for the longest point streak during the playoffs. Kuznetsov is just the seventh player since 1998 to register a playoff point streak of at least 10 games and the first since 2014. Kuznetsov’s 24 points (11g, 13a) lead the playoffs and mark a franchise record for most points in a single postseason. Dating back to Feb. 24, Kuznetsov has 52 points (22g, 30a) in 37 games. Additionally, Kuznetsov is the eighth Russian-born player to record double digits in goals for a single playoff year and the fifth to do so at 25 or younger. In 58 career playoff games, Kuznetsov has recorded 43 points (22g, 21a), tied with Mike Gartner for 12th place in franchise history. Time to Shine - Andre Burakovsky scored his first two goals of the playoffs in Game 7 of the Eastern Conference Final against the Tampa Bay Lightning to become just the second player in franchise history to score twice in a Game 7, joining Dale Hunter in the 1988 Division Semifinals vs. Philadelphia. Burakovsky recorded 25 points (12g, 13a) during the 2017-18 regular season, his fourth with the Capitals. Among his eight career postseason goals (44 playoff games played) are three multi-goal performances (2g vs. New York Rangers in Game 4 of the 2015 Second Round; 2g at Pittsburgh in Game 6 of the 2017 Second Round). Super Carly - John Carlson has recorded 16 points (3g, 13a) this postseason, setting a new franchise mark for points by a defenseman. Carlson’s 16 points are tied for the most among defensemen in the playoffs. Carlson has recorded a point in 11 of the Capitals’ 19 games this postseason. In 95 career playoff games, which is tied for the most in franchise history among defensemen, Carlson has 51 points (16g, 35a) and one game-winning goal. Carlson’s 16 career playoff goals are tied for the most in franchise history (Hatcher) among defensemen, while his 51 points are third in franchise history. Back at the Cup – The 2018 Stanley Cup Final marks the Capitals' second appearance in franchise history. The Capitals faced the Detroit Red Wings in 1998, losing the series 4-0. Joe Juneau led the Capitals in points (1g, 3a) while Brian Bellows led the team with two goals. Goaltender Olie Kolzig stopped 150 of the 163 shots he faced (.920 save percentage). During the 1998 playoff run, Juneau and Adam Oates each led the team with 17 points (Juneau: 7g, 10a; Oates: 6g, 11a). NBC Sports: Capitals vs. Golden Knights: Your guide to the 2018 Stanley Cup Final / Stanley Cup Final Preview: Who has better goaltending? Sports Illustrated Kids: How Could the Caps Win the Cup? 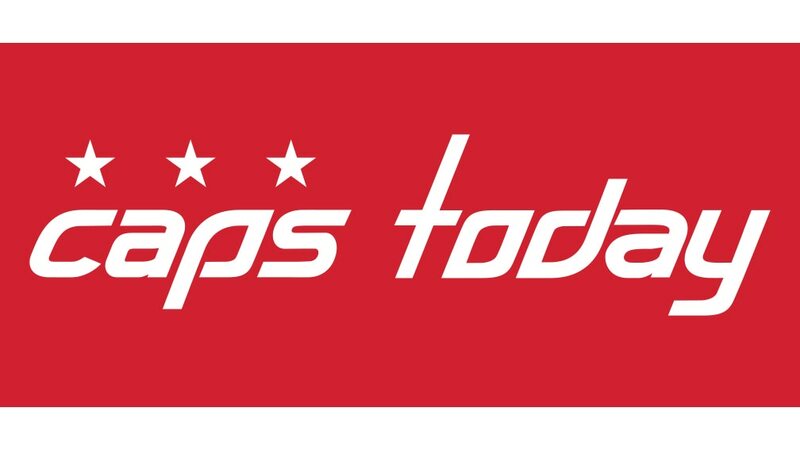 Please note Capitals Today has moved to CapitalsToday.com. The Washington Capitals will conclude the 2018 Caps Development Camp when they host Caps Fan Fest at Kettler Capitals Iceplex with activations beginning at 10 a.m.